SINGAPORE - The next time you fly Singapore Airlines, you could have comfort food for your inflight meals. SIA announced on Monday (Oct 31) that it wanted to offer Singaporeans "a little taste of home" while travelling and will offer, for four months, meal options such as cold crab (in first class), Teochew porridge (in business class) and braised duck (in economy class). Here are other airlines that serve local fare for that homey touch. 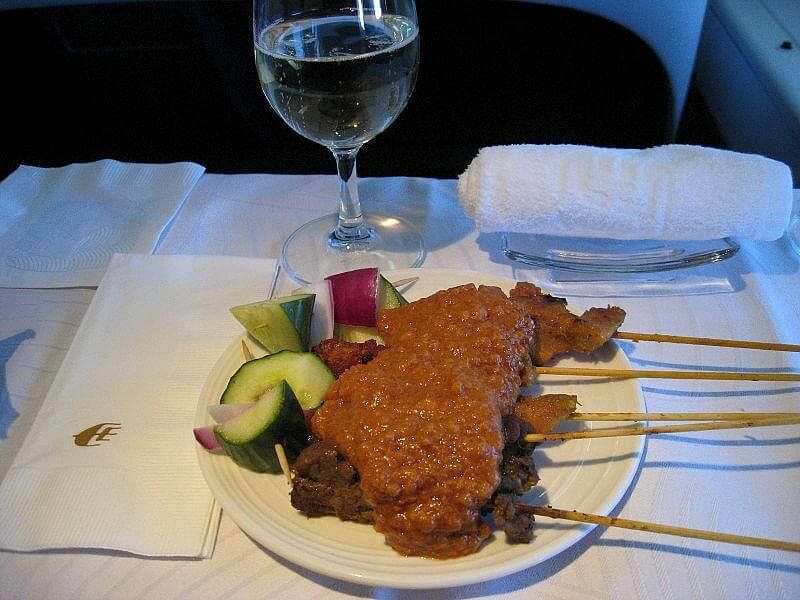 Across the causeway, Malaysia Airlines is known for its signature satay with spicy peanut sauce served on board in its business class cabin. The Chicken and Beef Satay skewers are, according to the airline's official Facebook page, "marinated overnight in fresh shallots, turmeric, garlic, galangal and lemongrass" for that authentic street food flavour. This is a platter of hummus dip, tabouleh (chopped vegetables), muhammara (hot pepper dip) and lahim bil agine (ground meat), served with Arabic pita bread. This spread, which comprises a selection of small dishes, is a popular starter across the Middle East and the Mediteranean . It is served in all classes. The schnitzel is a national dish of Austria, its country of origin. It consists of flour-coated tenderised meat that is fried. Veal is usually used in the dish. 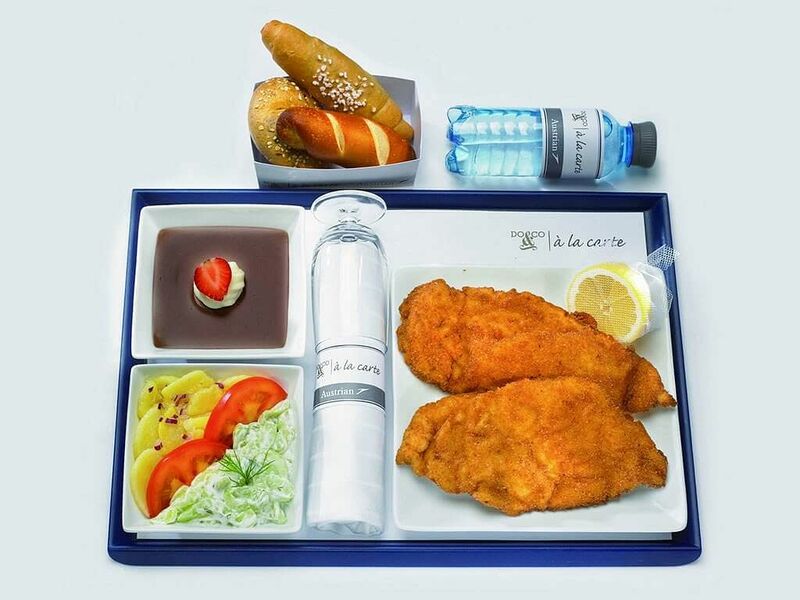 The Viennese schnitzel can be purchased pre-flight as an add-on a la carte dish for €15. 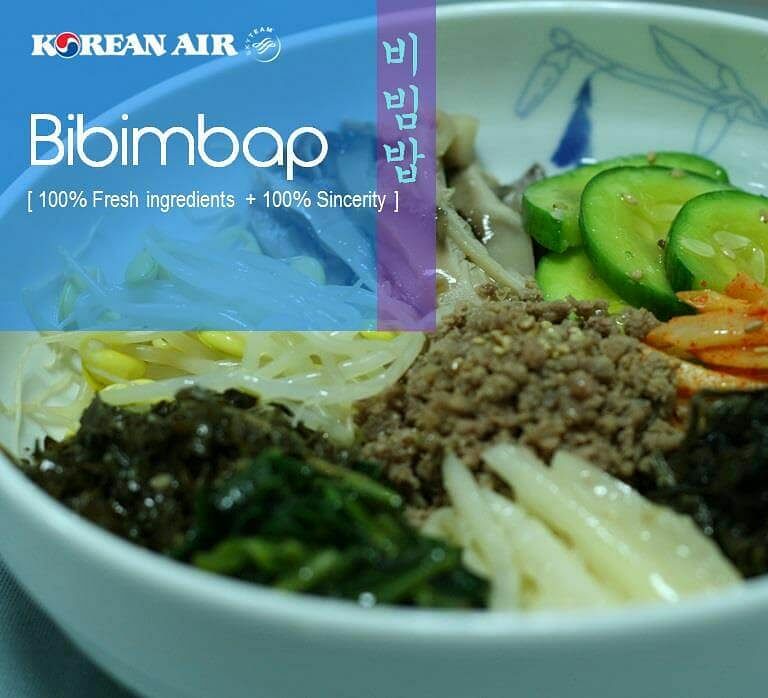 The signature Korean rice dish is available onboard across all classes with the usual mix of meat and vegetables and of course, bibimbap sauce. The sauce comes in a sealed tube similar to a toothpaste container. Add it all in, and mix away. 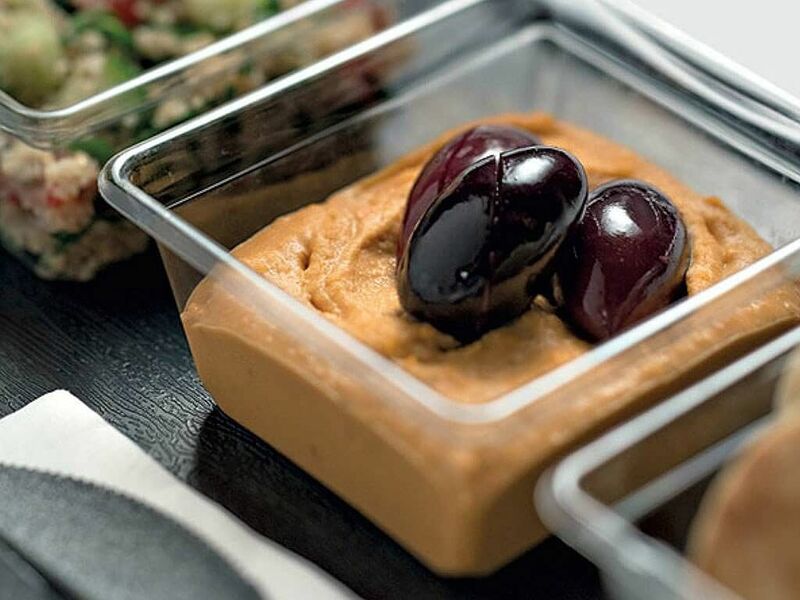 Hong Kong-based Cathay Pacific offers the classic Cantonese dish in its first-class cabin. The first-class menu was designed by the Mandarin Oriental Hotel Group. 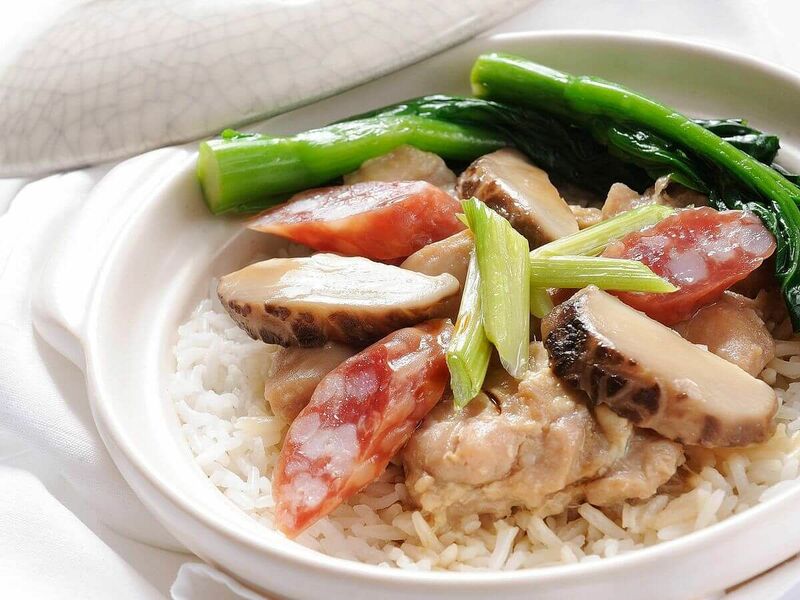 The dish, which comes in a claypot, is cooked with the classic ingredients of chicken, mushrooms and Chinese sausages. If you want a taste of the wagyu equivalent of chicken, then Nippon Airways business class is the way to go. Jidori chicken is reputed to be the most delicious breed of chicken in Japan. And Nippon Airways serves this in the style of the Akita specialty of kiritanpo nabe. In this dish, cooked rice is mashed, moulded around a skewer and then roasted. These dumplings are served in a hotpot which includes the jidori chicken breast and thigh, as well as minced into balls. 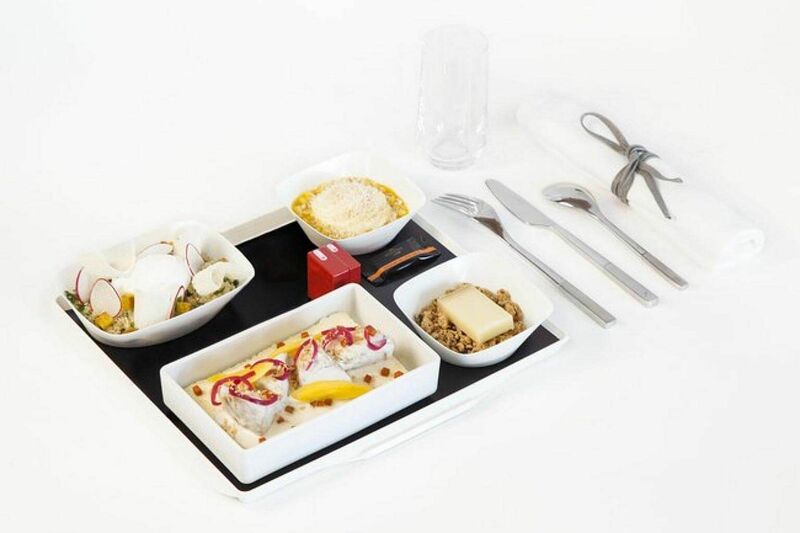 France is associated with fine dining, so it is no wonder that Air France, besides its regular inflight meals, also offers additional meal options designed by star chefs and restaurants. The Le marche de Jean Imbert, designed by the chef who won the French version of Top Chef in 2012, costs €21 (S$32.31). It comprises a cold starter with organic quinoa, poached egg and tarragon herb, a warm stew and a fruity fondant dessert. Une selection Lenotre is designed by famed French restaurant Maison Lenotre. Price at €28, it offers an antipasti, a main course of sea pike in herb crust with lemongrass sauce and mixed vegetables. There is also Cantal cheese with grapes and a dessert of lemon hazelnut delight.